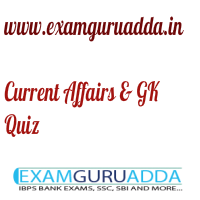 Dear Readers Examguruadda.in presents Current Affairs quiz of 11-12th December 2016 that cover important current affair events. Current Affairs quiz for IBPS PO,clerk, RRB-Po,Clerk, SBI, NIACL,Railways and SSC Exams. 1. Who has been sworn as new Prime Minister of New Zealand? 2. Gotthard Base tunnel is located in which country? 3. Who was sworn in as United National General Secretary? 4. When is the International Mountain Day observed globally? 5. Name the state which launched Narmada Seva Yatra ? 6. Who has became the first Indian captain to score three double hundreds? 7. Who was named as Italy's new prime minister? 8. Who has been given the Legion d'Honneur, France's highest honour? 9. Who has been appointed as the new Director General of the Inter-Services Intelligence (ISI)? 10. Who has been appointed as part-time non official directors on the board of the directors of Canara Bank?